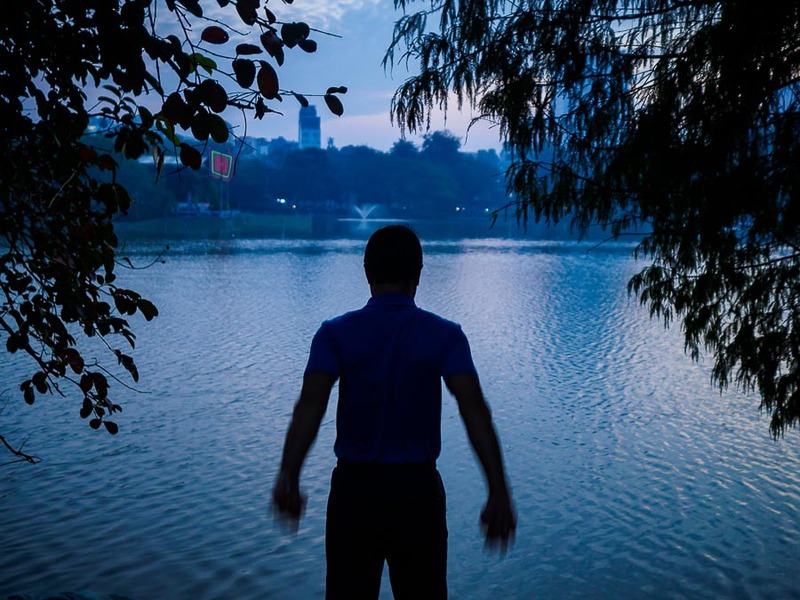 A man stretches before exercising at Hoan Kiem Lake in the Old Quarter of Hanoi. This will be my last post from Hanoi. 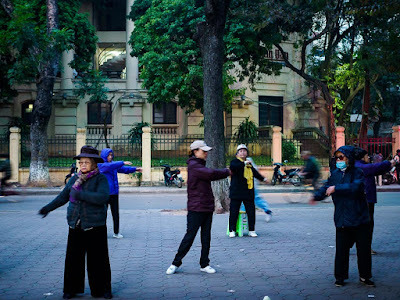 I walked down to Hoan Kiem Lake early one morning to photograph people working out on the lake shore. This is a traditional activity in much of Asia. I've photographed people in early morning aerobics on Sisowath Quay in Phnom Penh, in Lumpini Park in Bangkok and in markets in Bangkok. 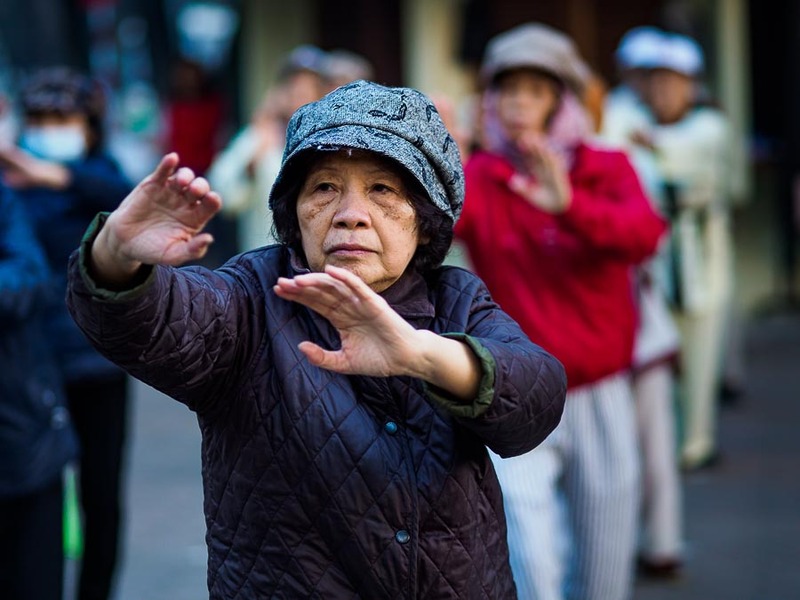 Most of the people in the exercise groups are older - it's a good way to keep people active and avoid the lifestyle diseases that set in at middle age. Women stretch before their aerobics group starts. Most of the exercisers at Hoan Kiem Lake were practicing "low impact" type exercises, lots of stretching and tai chi exercises. But there were also high impact exercises going on. People lifting weights, jogging and running around the lake. Spotters? Spotters? We don't need no stinking spotters. Lifting weights in the morning. 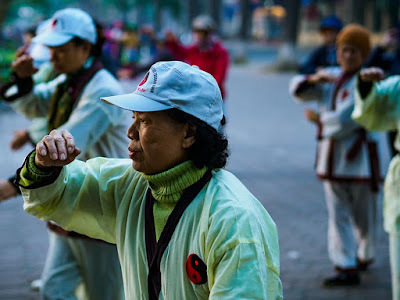 While a few meters away, tai chi classes go on. 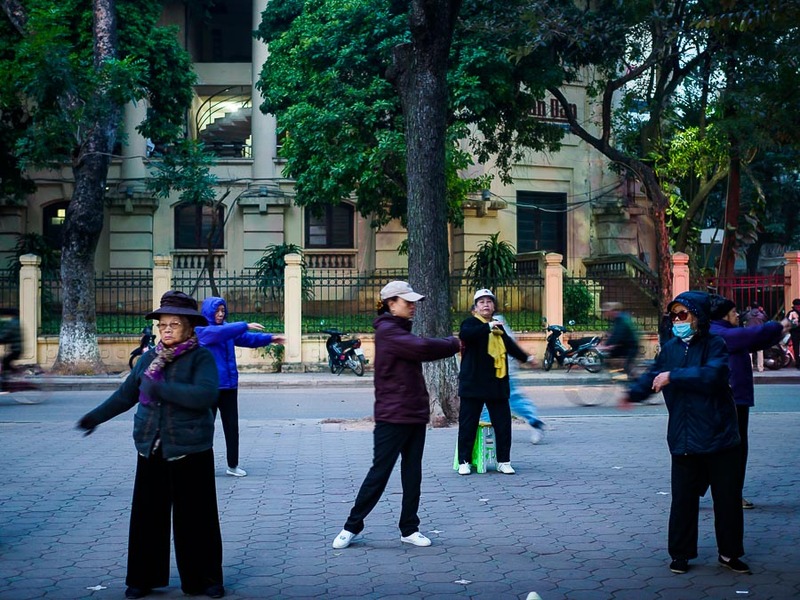 Almost of the people in the exercise groups were Vietnamese. A couple of tourists joined one group, but they couldn't keep up, even with the low impact stuff. Most of the other tourists and Europeans were jogging around the lake. 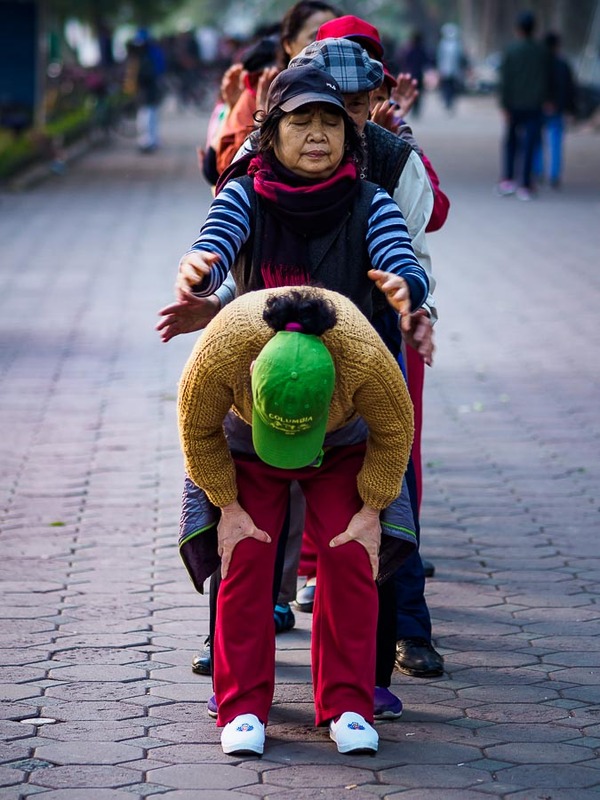 At the end of the exercise sessions, people got in line and gave each other back massages. 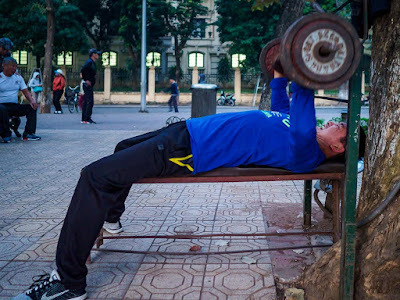 Not something I've seen in exercise groups in Thailand and I don't remember seeing in Cambodia. Back massages and rub downs after the exercise class. I don't know how effective the massages were. 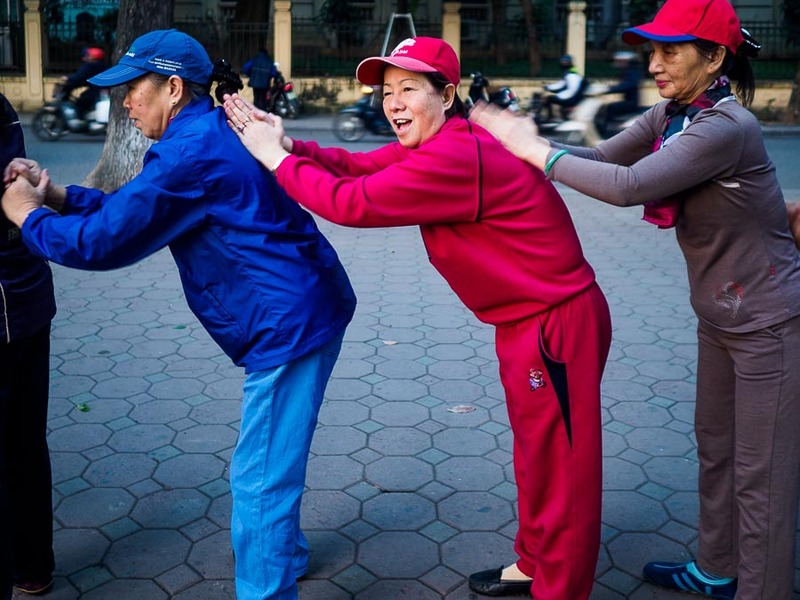 There are more photos of the exercise groups in my archive or available from ZUMA Press.